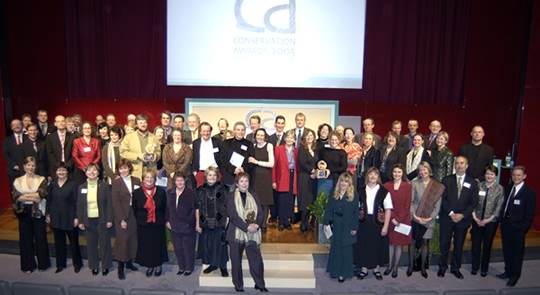 The PREMIS Working Group - a team of 30 experts from five countries - was awarded the prestigious Digital Preservation Award for 2005 tonight by Loyd Grossman OBE FSA at the Conservation Awards ceremony held at the British Museum. This is the tenth anniversary of the Conservation Awards, which this year has a new sponsor - Sir Paul McCartney. 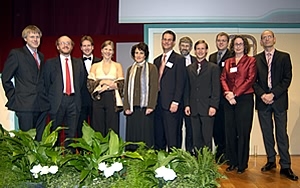 This is the second year to include the DPC-sponsored £5,000 Digital Preservation Award, which was awarded to the PREMIS Working Group for "leadership and advancement in digital preservation which will benefit the UK"
The winning team's work is to do with "preservation meta-data", which is essential to ensure that digital objects remain accessible over time. . The work of the PREMIS Working Group goes a long way towards establishing an international open-source standard for handling meta-data, which will help libraries and institutions around the world to archive digital content - the volume of which is doubling every year. The PREMIS team were chosen ahead of four other shortlisted projects, including overseas entries from the Vienna University of Technology and the National Archive of the Netherlands. Two UK entries also made the shortlist: a team from the BBC for their work rescuing and restoring early colour programming (including unseen episodes of Dr WHO); and the UK Web Archiving Consortium, a group lead by the British Library, which is creating a searchable archive of selected UK websites. The judges were impressed by the work PREMIS has done in compiling a "data dictionary" identifying core digital preservation metadata, which they have supported with practical examples and a software protocol. A key factor in the decision was the international scope of PREMIS, and the consensus building and collaboration that is so crucial in so many digital preservation issues. The Vienna University of Technology recognises the difficulty in choosing a long-term preservation strategy, whether the material be digitised or born digital. It has developed a workflow evaluation tool to assist in the selection of an optimal preservation solution (eg. migration, emulation, or computer museum), thus enabling the user to make an informed, well documented and accountable decision for the implementation of a specific strategy for a given collection. Their approach has a wide application and has been successfully applied to video, audio and document records. Digital Preservation Testbed. Applicant: National Archives of the Netherlands. The Digital Preservation Testbed project, developed by the Nationaal Archief of the Netherlands, is a practical research project to investigate options to secure long-term accessibility to archival records. The Archief carried out experiments based on series of solution-oriented research questions, in order to decide which preservation strategy or combination of strategies would be most suitable. The Testbed focused on three different methods for the long-term preservation of digital information, namely migration, XML and emulation. These methods are assessed not only in terms of their effectiveness, but also in terms of their limitations, cost and possibilities for use. From June 2005, the Testbed will operate as the Digital Preservation System of the Nationaal Archief. PREMIS (Preservation Metadata: Implementation Strategies). Applicant: PREMIS Working Group. Sponsored by the OCLC and RLG, PREMIS is an international working group set up to define a core set of preservation metadata elements, applicable to a broad range of digital preservation activities and to identify and evaluate alternative strategies for encoding, storing, managing, and exchanging preservation metadata - in particular, the core metadata elements - within and across digital preservation systems. Its activities culminated in the release of a Data Dictionary for Preservation Metadata: Final Report of the PREMIS Working Group (May 2005). The Data Dictionary is a comprehensive guide to core metadata for supporting the long-term preservation of digital materials. PREMIS has made a vital contribution to the development of effective digital preservation solutions by creating and moving forward an international standard for preservation metadata. Reverse Standards Conversion. Applicant: British Broadcasting Corporation. The recovery of significant early British colour television programmes by the BBC, which were degraded when they were converted to an American TV standard in the late 1960s and early 1970s. An innovative project that overcomes problems dealing with an obsolete video format, resulting in the digital conversion of some 80 programmes to broadcast quality, ensuring their preservation for future generations. UK Web Archiving Consortium. Applicant: The Consortium. Six leading UK institutions, The British Library, the National Libraries of Scotland and Wales, JISC, the National Archives and the Wellcome Library, have formed the UK Web Archiving Consortium (UKWAC) to deliver a searchable archive of selected UK websites. This pioneering project addresses the lifecycle of websites from selection, through rights clearance and capture, to access by the public and long-term preservation. The collaborative venture went live at www.webarchive.org.uk on May 9th 2005. In his original presentation to the judging panel, Brian Lavoie of the PREMIS Working group said: "This work illustrates a gradual shift from articulating the problem to solving it ... it's not so much 'Why is digital preservation important?' anymore; rather, 'What must be done to achieve preservation objectives?'." Preservation metadata was crucial to implementing reliable, sustainable digital preservation programs, he said. "The issues of long term storage of digital resources are unique to the digital space. A digital object needs to be supported, wrapped in this metadata so it can be kept." 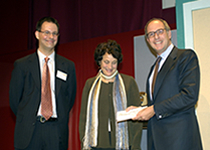 TV presenter and culinary entrepreneur Loyd Grossman, who helped to launch the DPC in 2002, presented the award. "It's reassuring to see how much things have progressed since we started, but it is still daunting to realise how much still needs to be done," he said. "History will judge us very harshly if we are unable to overcome the obstacles to preserving access to our burgeoning digital cultural heritage so we need to encourage and reward those who are working to secure it." The Digital Preservation Coalition sponsors the Digital Preservation Award under the banner of the Conservation Awards, which are supported by Sir Paul McCartney and managed in partnership by key organisations in conservation, restoration and preservation management: the Museums, Libraries and Archives Council (MLA), the UK Institute for Conservation (UKIC), English Heritage, the Institute of Paper Conservation (IPC) and the National Preservation Office. UKIC and IPC are in the process of merging with other organisations during 2005 into a new larger professional body for conservation of the cultural heritage, the Institute of Conservation. The Anna Plowden Trust sponsors the Award for Research and Innovation in Conservation.